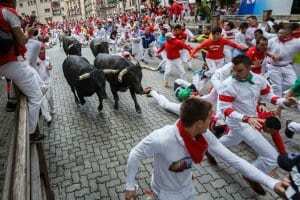 Pamplona, capital of the delightfully picturesque Navarra region, is best known for its daredevil bull-running fiesta, which is held in July. 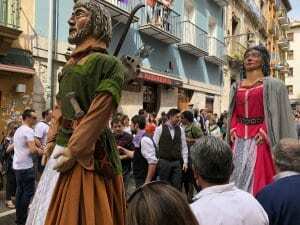 Hoards of tourists pour into the city during the fiesta of Los Sanfermines, which gained worldwide fame after Ernest Hemingway described it in his novel The Sun Also Rises. If you like frenetic energy then you’ll love Pamplona during this period – the city literally explodes into life. Yet a visitor to Pamplona in September, or May for example, will see a very different side to this multifaceted city; a charming, elegant destination that is bursting with history on every street corner. Indeed, it is no exaggeration to say that Pamplona boasts a very long and proud history. Like many regions across the Iberian Peninsula, the area was first inhabited around 800,000 BC – hunter-gatherers led a nomadic lifestyle, although they were eclipsed by a Neolithic farming population from 5000 BC. First, in a wave of settlers from the Mediterranean, the Phoenicians landed in 1100 BC, to be followed by the Greeks and Carthaginians. However, all these powers were eventually supplanted by the Romans, who arrived in 218 BC. Over the next few hundred years, the Roman way of life was implanted across Spain – Pamplona or Iruna in Basque is said to have been founded by the Roman general, Pompey, in 75 BC. The Romans managed to keep control of the Iberian Peninsula for centuries, until the Western Empire collapsed in the 5th century AD. This was a dark period for the citizens of Pamplona, as the settlement was repeatedly attacked and overrun during the many battles between the competing powers of the Visigoths, Basques, and Franks. In 466, Pamplona was taken by the Visigoths count Gauteric, who subsequently lost the settlement to the Franks in 541. However, in 581 it was retaken by the Visigothic king Liuvigilid, who fought back the Basques from northern Spain. This was indeed a turbulent and dangerous time for all Navarrans. Yet it is also during this era that the first mentions of Saint Fermin arise – the first bishop of Pamplona is said to have baptized 40,000 pagans in just three days. Today, all of Pamplona celebrates his legacy in July by taking part in Spain’s most legendary festival – Los Sanfermines. In the famous encierro (bull running) six bulls are traditionally released early each morning to run from their corral through the narrow cobbled streets of the beautiful old town. On the last night of this week-long, non-stop party, crowds with candles sing Basque songs in the main square. It’s truly a sight to behold. In 711, Arab and Berber armies crossed into Spain from North Africa and quickly subdued most of the country. They easily swept aside the feeble opposition from the disorganized Visigoths, establishing one of the most brilliant and forward-thinking civilizations of early Medieval Europe. Pamplona was fortunately saved from any more bloodshed, as a treaty was brokered between its inhabitants and the Arab military commanders. However, their rule over Pamplona was not to last and in 755 the Basques defeated the last governor of Al-Andalus – Yusuf al Fihri. After further fighting between the Christian forces of Northern Spain and the Muslim armies, Navarra emerged as an independent Christian Kingdom in the 10th century, after Sancho I Garces became king of Pamplona. Sancho III the Great expanded the kingdom, and at his death in 1035, Navarra stretched all the way from Ribagorza in Aragon to Valladolid. This was a glorious time for Pamplona – its growing religious importance led to merchants and traders flocking to the thriving town, encouraging the construction of new boroughs, buildings and amenities. It was also a very enlightened period – Sancho VI the Wise, who reigned from 1150-94, recognized the independent rights (fueros) of many towns. In the 13th century, Navarra passed by marriage to a line of French rulers. 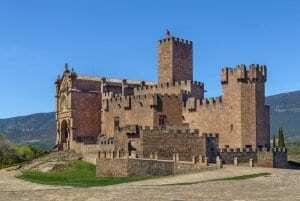 One, Carlos III the Noble, built Olite castle, one of the most impressive Spain has ever known. Nevertheless, despite the political upheaval, this was a generally stable and prosperous time for Pamplona. However, the 15th century would see drastic social and political change across Spain and indeed Navarra. The marriage of Fernando and Isabel in Valladolid in 1269 laid the foundations of the Spanish nation-state, uniting their lands in military, religious and diplomatic matters. The last Moorish stronghold, Granada. fell in 1492 and Navarra was subsequently annexed by Fernando II in 1512. Fortunately, the region kept its own currency and laws until the 1800s, which helped Pamplona to grow into a culturally important and wealthy city. Spain’s Golden Age is said to have occurred in the 17th century, which saw the rise to prominence of the country’s most famous artists and writers. 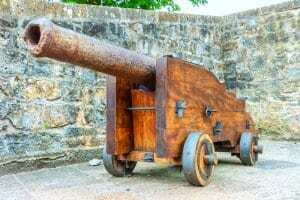 Yet it was a contradictory period in Spain’s history, as this brilliance occurred against a backdrop of economic deterioration and several costly wars with France and the Low Countries. The death of Carlos II in 1700 brought the Habsburg line to an end and Felipe V, the first Bourbon king, ascended the throne. The 18th century was a generally prosperous time for Pamplona – major improvements to the city’s housing and infrastructure were made. Rich merchants and aristocrats built lavish mansions that remain intact today. But unfortunately, the good times were not to last. In the 19th century, this fortress-city played a key role in several wars including the War of Independence (Peninsula War). French troops occupied the city during the conflict – it remained in French hands until 1813. During the Carlist Wars, which were caused by another dispute over the succession, Pamplona sided with the liberals, although the Navarran countryside populace remained in support of restoring Carlos V. The infighting of the last Carlist war prompted the government to build a fort at the top of Mount San Cristobal, just 2 miles north of Pamplona. Nevertheless, in 1860 the railway came to Pamplona and the city enjoyed some growth during the Industrial Revolution. Sadly, the 19th and 20th centuries were anything but peaceful and prosperous for Pamplona’s citizens. Spain’s first republic lasted only a year (1873) and consumed four presidents. The 19th century was a time of national decline, with Anarchism developing in reaction to rampant political corruption. Indeed, Spanish politics was becoming increasingly polarized – King Alfonso XIII was forced to abdicate and the ill-fated Second Republic was declared in 1931. Nationalist Generals rose against the government in 1936, starting the Spanish Civil War. The Nationalists, under General Franco, were halted by the Republicans outside Madrid, but with support from Hitler and Mussolini, they inched their way to victory to the north and east. Madrid finally fell in 1939 and the war was over. Thousands of Republicans were executed in reprisals and Spain was internationally isolated until the 1950s. Today, Pamplona is very much a poster child for the face of contemporary Spain – embracing modernity while not losing sight of its history and rich cultural traditions. Any visitor to the city during Los Sanfermines can vouch for that fact. Yet even when the bulls aren’t thundering down the cobblestones, Pamplona is worthy of a detailed exploration. With its grand cathedral, archaeological treasures, beautiful squares and a surfeit of enticing restaurants and bars, it’s easy to see why so many – Ernest Hemingway included – have fallen under Pamplona’s magical spell. The cuisine of Northern Spain has long been distinguished by abundant fish and seafood from the Atlantic. And despite its landlocked status, Pamplona does not disappoint gastronomes searching for divine seafood; its relative proximity to the Cantabrian Sea has led to the creation of several traditional dishes that use hake, sea bream, horse mackerel and baby squid to fantastic effect. Cod stew with red peppers is one of our personal favorites. But ultimately, Navarra is the home of flavorsome meat and delicious, fresh produce, arguably some of the finest in Spain. The region has a long and proud culinary tradition that involves friends and family dedicating a serious amount of time to the enjoyment of good food and wine. 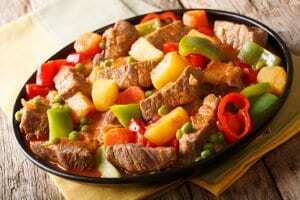 The most famous meat dish is the “caldereta”, a potent mix of lamb – or rabbit – potatoes and several vegetables. A mild, relatively wet climate may put a potential dampener on summer celebrations, but the upside is beautiful green scenery that yields a variety of fresh vegetables, particularly artichokes, little gem lettuces, white and red cardoons, borages, piquillo peppers, asparagus, and beans. The Porrusalda is a lovely winter-warming vegetable stew, while the estellesa soup combines lard, rice, and milk. Migas (deep-friend breadcrumbs) is another Navarran specialty. Meanwhile, no household in Pamplona can omit the serving of ox stew following Los Sanfermines festival, nor roast lamb served with tomatoes and peppers. Roast suckling pig and kid are also firm favorites – Navarran gastronomy is usually defined by its wholesomeness and deference towards seasons ingredients, rather than sophisticated culinary techniques. Navarrans are also particularly fond of the hunt and wild game, ensuring that restaurants are endowed with wild boar, venison, partridge, quail and pigeon in the autumn/winter months. All of which pairs very nicely with Navarra’s growing range of red and white wines. Although Rioja grabs all the headlines, Navarra is increasingly one of the great unsung heroes of Spanish winemaking, offering excellence and astonishing value in equal measure. The region offers a complex mosaic of terroirs and micro-climates, from the cooler and wetter northern mountainous sub-zone to the drier conditions of the centre. Grenache thrives in this climate, offering wines with a bright acidity and an inimitable freshness and sense of place. The region is also planted with a large cross-section of Spanish and international varieties, including Tempranillo, Cabernet Sauvignon, Merlot, Graciano, Viura, Malvasia and Chardonnay. The top names to look out for are: Bodegas Julian Chivite – their 125 Chardonnay is arguably the best white wine in Spain – Domaines Lupier, Bodegas Ochoa and Palacio de la Vega. Built in ochre-colored stone, Pamplona’s cathedral is breathtaking. It was constructed on the foundations of its 12th-century predecessor, and is mainly Gothic in style, with twin towers and an 18th century facade. Inside there are lovely choir stalls and the alabaster tomb of Carlos III and Queen Leonor. The Baroque Palacio de Navarra is simply stunning. Its opulent throne room of the kings of Navarra contains a famous portrait of King Fernando VII by Goya. Outside, a statue of 1903 shows a symbolic queen upholding the fueros of Navarra, the historic laws granted to the region when it became part of a centralized Spanish state. A lovely medieval church, San Saturnino is built on the site where St. Saturninus is said to have baptized some 40,000 townspeople. A fascinating tour of regional archaeology, Pamplona’s signature museum is well worth a look. Exhibits include Roman mosaics and an 11th century Islam-inspired ivory casket. There are murals painted during the 14th-16th centuries, a portrait by Goya, and a collection of paintings by Basque artists.